Get a Chief’s Shop hat! Enter your email address to subscribe to this blog and receive notifications of new posts by email. If you receive a message that your e-mail address is invalid, please visit my blog page and sign up in the area on the right-hand side of the page. 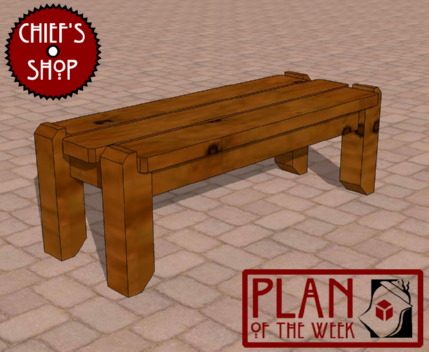 The Chief’s Shop Outdoor Dining Bench also makes a nice campfire bench or patio/deck bench. You can also pair it with any number of table projects I’ve created. It can be built starting at roughly $18 for lumber (treated). A miter saw, drill/driver, and Kreg Jig are needed to complete it. Download this free woodworking plan pdf file by clicking on the image at left. Visit Chris Hill's profile on Pinterest.